FORMER Gambian president Yahya Jammeh, who was finally forced to give up power at the weekend when the no-nonsense Economic Community for West Africa (ECOWAS) had sent a Senegalese army unit to topple him, says President Robert Mugabe was behind his mischief. The disgraced former Gambian leader said Mugabe had pressurised him into rejecting his defeat with a promise to ensure that he stayed in power, only for the world’s oldest leader to disappear without trace. 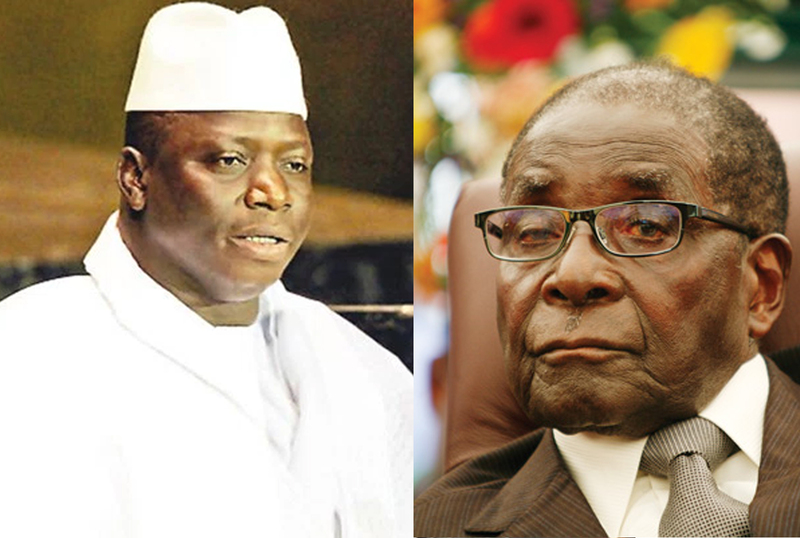 Jammeh told Zimbo Today.com here in Malabo —where he has been offered asylum by the Government of Equatorial Guinea—that after he lost the December 1 elections and rightly conceded defeat to Adama Barrow, a furious Mugabe had contacted him, accusing him of being “unAfrican”. “He told me that I was behaving in a very unAfrican way and that I should “un-concede” the defeat so that, as a respected African statesman, he could work out an inclusive government in which I would remain President even after having lost the elections, with the winner, Barrow, being given a ceremonial post of Prime Minister,” Jammeh said in an interview. “He assured me that this arrangement would give me a chance to consolidate my hold on power in preparation for a forceful come-back and it was a strategy that had worked perfectly for him… he assured me that he was going to send a crack team from his army that was going to be imbedded in the Gambian army so that we could easily repulse any foreign military intervention, but after I agreed to his plan of action and “un-conceded” the defeat, he was no where to be see… I was left alone and I feel betrayed and let down,” Jammeh added. Jammeh said Mugabe insisted that it was not unAfrican for incumbents in Africa to lose power to the opposition and it was also unAfrican for good leaders to leave office. Mugabe has been on his annual vacation since late December when Jammeh strangely turned around to reverse his decision to accept defeat to Barrow and has been unusually quiet throughout the better part of this saga. Efforts to get a comment from Mugabe’s office in Harare were unfruitful and both him and his spokesman were out of the country and could not be traced easily.